The pioneer of Team Fortress 2 gaming in Hong Kong. Effective immediately, the GoldDustGravelBasin will be replaced by a new server called Essentials, running the most popular map of selected map types. You will be able to book the scrim server without finding an online admin right from Trilogy’s website. It’s faster, easier and much simpler. We will be updating Trilogy to deliver unified design aesthetics across the board, you will also be able to participate in discussions to help improve Trilogy. We will let you know what they are when they are released. We hope you love the changes as much as we do. Due to unknown reasons, the PSU of our server burnt out. Luckily we switched it off immediately and therefore the other electronic components are not affected. However, the PSU is beyond repair and needs replacement. We will get one as soon as possible. In the meantime, we hope that you can still enjoy Team Fortress 2 in other servers. On behalf of the Trilogy.hk admin team, I apologize for the inconvenience caused by this incident. Statistics Have Been Reset and the First Awardees of Trilogy.hk Rewards! As usual, we’ve just reset our stats database so that players have a fair chance to climb to the top. The next reset is scheduled to be conducted on January 14, 2013. This also marks the first time we’ve awarded players Mann. Co. Supply Create Keys. We’d like to congratulate the following players for having the highest HLStatsX points or the highest playtimes! Note that the Steam player names below are taken from their last appearance on Trilogy.hk servers. We will reach these players shortly. Please note that if players do not respond by October 21, 2012 12:00 AM (GMT +8), we’ll pick the next winning player. If you don’t make it to the above lists, don’t be disappointed! As mentioned, we’ve just reset the database and you can again compete your way to the top, as we’ll pick the 3 best-performing players and 3 most loyal players on the next reset! We’d like to thank EVERY player who has played on our servers for their unremitting support for us. We wouldn’t be here if it weren’t for you. So, thank you again! Few people in Hong Kong servers play Medic. The reason is obvious: You are weak in general combat. You always die as you are the most prioritize target. Your teammates won’t support you. 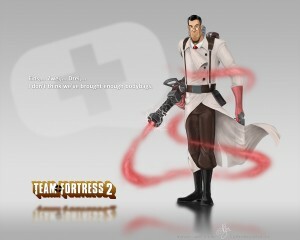 However, the Medic class is one the the most important class in the game. The reason is also very obvious: You can keep your buddies healthy and happy during combat. You can unleash deadly Übercharges, Kritz, Megaheals, so that your team can advance or stop an assault. Many times when you join a server, the team with more Medics is likely to be the winning team. As the Medic class is of vital importance, the existence of this unofficial guide becomes significant, and I hope after reading this guide, you can be the tide-changer in any of the matches.